Replaces the original material cooling fan, which has significant amount of back-blast (, i.e. inefficient,) with an impeller type fan, and a fan duct and nozzle design similar to that on a Replicator 2.<br>Print quality is improved, but nozzle design still needs improvements. I bought my fan at an electronic parts supply store. It&nbsp;<br><br>Part was printed in PLA &nbsp;on my Ultimaker using Cura 14.03.<br>Designed using ViaCAD v9.<br><br>1. Print part&nbsp;at 0.2mm layer, 80%~100% fill, no support.<br>2. Tear out support structures.<br>3. Replace connector on fan if necessary.&nbsp;<br>4. 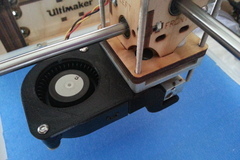 Mount fan to printed part using 20mm long screws and nuts.<br>5. Mounts directly to carriage thumb screws using 2 nuts.<br>6. Connect and tidy up wiring.